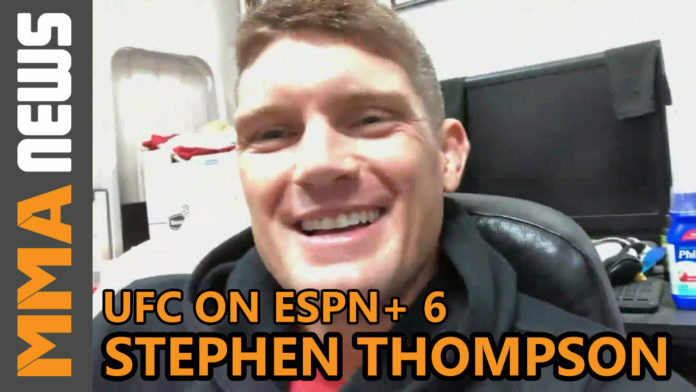 Stephen “Wonderboy” Thompson will be the first to tell you, Anthony Pettis wasn’t an opponent he had in mind for his next fight. While many fans have voiced their displeasure with the former featherweight title challenger facing Thompson, the South Carolina native isn’t taking his opponent lightly. Thompson (14-3-1) looks to avoid back-to-back losses for the first time in his career when he faces Pettis in the main event of UFC on ESPN+ 6 in Nashville on Mar. 23. Losing two of his last three fights to Tyron Woodley and Darren Till, Thompson has been criticized for having boring fights. The 36-year-old believes Pettis is the type of opponent that will bring out the best in him and that we’ll see the old “Wonderboy” in this matchup. Despite losing out on a matchup against Robbie Lawler – who faces Ben Askren on Mar. 2 at UFC 235 – Thompson says he’s still interested in that fight. One of the main things he’s emphasized is the need to keep fighting top level competition in the division. One of Thompson’s close friends, former UFC welterweight champion Georges St-Pierre, announced his retirement on Feb. 21. The former Karate champion was surprised by the decision feeling “GSP” still had a few fights left in him. One interesting tidbit Thompson revealed was that St-Pierre actually called him ahead of the rematch against Woodley at UFC 209, saying that he would never fight him if he decided to return to the welterweight division. UFC on ESPN+ 6 takes place at Bridgestone Arena in Nashville, TN on Mar 23.